CMS will indeed consolidate components of three existing programs: Physician Quality Reporting System (PQRS), the Physician Value-Based Payment Modifier (VM), and the Medicare Electronic Health Record (EHR) Incentive Program for MIPS eligible clinicians (formerly eligible professionals). Once MIPS goes into effect in 2019, these programs will no longer exist. The following are MIPS eligible clinicians who can initially participate in MIPS: Physicians, physician assistants, nurse practitioners, clinical nurse specialists, certified registered nurse anesthetists, and groups that include these clinicians. Under the MACRA’s requirements, MIPS would distribute payment adjustments to between approximately 687,000 and 746,000 eligible clinicians in 2019. MIPS would distribute approximately $500 million in exceptional performance payments to MIPS eligible clinicians whose performance exceeds a specified threshold. According to CMS, most clinicians will initially participate in the Quality Payment Program through MIPS. The agency anticipates that more providers will qualify for an APM after the first year and move in this direction. Quality (replaces PQRS and the VM). Fifty percent of the total score in year #1, 45% in year #2, and 30% in 2021 and beyond). Physicians choose six quality measures to report on from an extensive list of options tailored to each specialty and practice. Advancing Care Information (formerly Meaningful Use [MU]). Twenty-five percent of the total score in year #1, 25% in year #2, and 25% in 2021 and beyond). Clinicians report customizable measures with an emphasis on interoperability and information exchange. CMS has made some notable changes to MU. According to the proposed rule, this domain aims to “support the vision of a simpler, more connected, less burdensome technology.” The proposal will “allow physicians and other clinicians to choose to select the measures that reflect how technology best suits their day-to-day practice.” Clinicians also won’t need to report on measures related to Clinical Decision Support (CDS) and Computerized Physician Order Entry (CPOE). Clinical Practice Improvement Activities. Fifteen percent of the total score in year #1, 15% in year #2, and 15% in 2021 and beyond). Clinicians are rewarded for activities such as care coordination, beneficiary engagement, and patient safety. More than 90 reporting options are available, and clinicians also receive credit for participating in APMs and Patient-Centered Medical Homes. Cost (replaces the VM). Ten percent of the total score in year #1, 15% in year #2, and 30% in 2021 and beyond). This score is based on Medicare claims and does not require any additional reporting. The category uses more than 40 episode-specific measures. In 2019-2014, physicians who meet APM standards (i.e., qualified providers [QP]) will receive a lump sum payment of 5% of their prior year Medicare Part B payment. For years 2026 and later, physicians who meet program requirements will receive a higher physician fee schedule update than those who do not participate in an APM. Approximately 30,658-90,000 eligible clinicians would become QPs through participation in Advanced APMs, and are estimated to receive between $146 million and $429 million in APM Incentive Payments for CY 2019. Require participants to use a certified EHR. Base payments on quality measures comparable to those used in the MIPS quality performance category. Become either an enhanced medical home or bear more than nominal risk for losses. According to CMS, an APM meets the financial risk requirement if CMS would withhold payment, reduce rates, or require the entity to make payments to the agency if its actual expenditures exceed expected expenditures. What physicians can do now to prepare? According to its proposed rule, CMS estimates that 87% of the nation’s solo practices (nearly 103,000 physicians) will face a MIPS penalty in 2019. Nearly 70% of physicians in practices with two to nine providers will see a penalty. See p. 676 of the proposed rule for more information. Submit comments on the proposed rule. Go to http://www.regulations.gov, and follow the “Submit a comment” instructions. Comments are due June 27, 2016, 5pm EST. Focus on quality reporting—especially the six measures in the MIPS Quality Domain that will dictate 50% of a physician’s score in year #1. Decide what measures in the MIPS Advancing Care Information Domain make the most sense for your practice. For example, will you focus on patient electronic access, coordination of care through patient engagement, or health information exchange? Start exploring your options now. 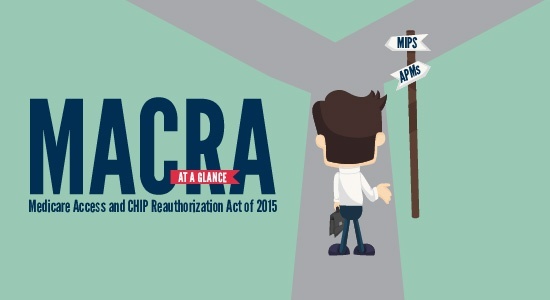 The time to plan for MACRA implementation is now. Take this time to strategize an approach, identify measures appropriate for your practice, and streamline processes. Learn more about how your EMR vendor can help you navigate these changes. Trying to Make Sense of EHR Interoperability? What Does it Mean for Small Practices?